Why CDN is a must for a faster Magento store! Whenever a user requests your site, the server closest to the user’s physical location will deliver the static content, ensuring the shortest distance for the data to travel. This ensures reduced latency and fastest site experience. For mission-critical websites, CDN is a must. A visitor in a particular location (e.g. California) makes the first request for a static asset on your website. The asset is retrieved from your actual server and when it is being delivered, the asset gets cached on the CDN’s California Server. 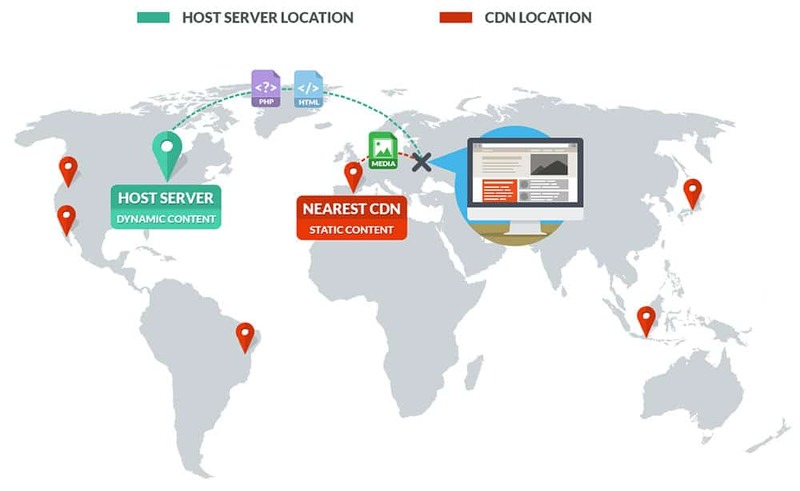 The nearest CDN is based on the visitor’s location. If that visitor makes a request for the same asset again, the request goes to the CDN edge server(s) to check if the asset is already cached. If the request is already cached by the same edge server, the visitor will receive a response from that server. Whereas, if the request hits a different edge server, step 2 will be repeated. Once your static assets are cached on all the edge servers for California, all requests for static assets will be delivered from the edge servers instead of the origin. This helps in improving the load time. Ensuring all your users have a consistent experience is important. By integrating CDN with your website, it boosts speed. For example, a website may be hosted in the US but have the majority of its users in India. Performance tools might show good speed on default server, but speed for Indian audience will not be up to the mark. A global CDN would allow a faster experience to your users across the globe, reduces latency, and improves site load. CDNs also prevent site crashes during traffic surges. This happens by distributing bandwidth across multiple servers rather than allowing only one server to handle all the traffic. The primary expense for any website is bandwidth consumption. CDN reduce this amount through caching and other optimizations. A good CDN may improve security by providing DDoS mitigation, prevents bots attack and improves security. How CDN Benefits Your Website? Enables you to refresh cached files on call. Some of the providers will only allow you to refresh the entire cache storage. Whereas, in some cases, your CDN provider will limit the number of pages after a given period of time. An effective purging request is measured in the time it takes. This allows you to set a specific period during which the cached asset should be served before refreshing. This allows easier management of specific files and is useful when managing the bulk file. Helps you manually override cache headers, tagging files that should never or always be served from cache. This is typically useful in cache management, especially during bulk file management. Most of the CDNs are 3rd-party services which can range from cost-effective to high-end setups. The cost of a CDN depends on region reach, your security requirements, and bandwidth. The costs of CDN have also come down considerably and you can get 1TB CDN data transfer for as low as $49 (~Rs. 3000). For example, if you have most of your users from Asia and the US, you can skip purchasing server nodes in Europe. Implementing a CDN is easier than it seems. You need to set up a CDN to mirror static files of your website. After that, you need to configure your site to send requests to those files to the CDN to handle. If you want to skip the optimization tasks, choose the right hosting provider for your website and they will take care of the rest. Although a CDN helps in improving your website performance, they aren’t mandatory. CDN is a next-level optimization which depends on your priorities, company goals, and budget. It’s always better to go for a managed hosting who has CDNs and other optimizations included.